Work like the masters with moody colours and luscious soft lights. Great artists such as Rembrandt and Caravaggio inject their artworks with a bit of drama and intensity, creating pieces reminiscent of the beauty and intensity of stage lighting. Pastels are a wonderful medium to capture this sort of intensity, particularly as you can work lights over darks, so that your subject emerges from deep shadows. Good quality pastel drawings have rich, moody colours as well as luscious, soft lights, with high contrasts. 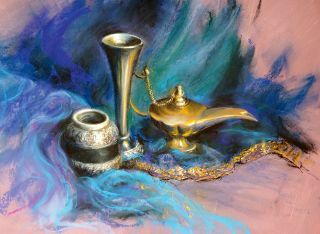 In this workshop we're using a still life with shiny objects to show how to lay down layers of dark under-colours, then gradually introduce subtle hues to create lustre, and finish with highlights to add shine and sparkle – and a touch of Eastern magic. When selecting pastel colours for a drawing like this, remember to include good quality rich darks and soft lights. For this piece we used Unison Colour Soft Pastels in BV 5, BV 18, BG 7, Dark 8, Dark 5, Grey 19, Y2, BE 18 or Grey 25, BV 4, Grey 28. We also used a Cream Conté Crayon and willow charcoal for the initial sketch; a Colourfix Pastel Primer surface; a scraper to refresh the surface between layers; a pencil eraser; and a scalpel. You can create drama by having a strong light source from one direction. The first image above is lit with an Anglepoise light directed at the still life to create high contrasts, warm tones, shine and sparkle. The second image above (use the arrow to scroll to see it) is lit with natural light from above on a dull day, and is far less inspiring. Drawing out in charcoal and a cream Conté crayon can help you think about tonal contrasts from the outset. Lines of flow between fabrics and objects will lead the viewer’s eye around the picture, which is all part of ‘telling the story’, whatever the subject matter. You can build more layers on a textured surface, such as Canson Touch or a surface coated with Colourfix Pastel Primer, than on normal paper, so you can create more depth. Any dark colour would make a good base for the warm objects. Start sketching in the first layer of dark blues for the background. As we will work lights over darks, add these same dark blues as the shadow base for the objects. Add lighter turquoise blues to the foreground fabric – letting the darks show through, to show that the fabric is slightly transparent – and deep green to the background to add layers of interest. This is where a dramatic piece gets its real depth. Screw up your eyes to look at your subject, find the deepest shadows, and don’t be afraid to press hard to get a good layer of pastel on. Use dark brown, not black. If you go over edges and lose shape, you can erase pastel with an eraser. Smudge back a lot of the deep darks. Using a warm mid-brown as the base for the brass lamp, add medium-tone layers to the objects. The lamp's warm glow reflects onto the silver candlestick and pot in our reference, so show that in the drawing. By scraping off the excess pastel dust between layers, you can refresh the texture of the surface. First, using a soft light pastel, such as Unison Colour Brown Earth 18 or Grey 25, add light marks for highlights. Then, clockwise, touch these gently with a finger to soften them back. Next, over those softened marks, add light highlight marks and don’t touch them at all. This three-stage process creates soft highlights that glow. To add tiny fine details and bright little shine marks, break the pastels into shards, either using your fingers or cutting them with a scalpel. These sharp pieces of soft pastel are far better for bright highlights than pastel pencils, as the pigment is richer. Don’t spend hours on details, but use a few quick strokes to convey the feeling of a pattern – or in this case, the gold edge of the fabric. This helps to create a feeling of life and movement. Our brains are very adept at filling in the gaps. Add brighter purples and blues to enrich the fabrics. To finish off the illusion of sparkle and shine, add more flicks of highlights, with a shard of cream pastel, the only very light pastel we’ve used. These flicks are few and far between, and carefully observed. Never smudge the last touches, or they’ll die back. This article originally appeared in issue 11 of Paint & Draw magazine, offering tips and inspiration for artists everywhere. Buy issue 11 here.